They walked miles, spent days in blazing heat without shelter and food, and arrived sunburnt, blistered, and scarred, but the hundreds of Iraqi Yazidi who made it across the Turkish border are the lucky ones. They survived their journey. They found a way off the besieged mountain where many of their former neighbors have died seeking refuge from extremist militants, while many more remain stranded. Now, in a newly-established refugee camp near the Turkish town of Silopi, they say that they will never return to their homes. This exodus, they told VICE News, is the end for Iraq's long-persecuted Yazidi population. "We will never go back,” Sosin Omar, a 29-year-old mother of four, told VICE News. “And I never want my children to go back there either.... We'll go to any country but Iraq." Yezidis follow an ancient religion incorporating elements of Islam and indigenous beliefs, but the hardline Sunni militants, known as the Islamic State, that overran parts of northern Iraq in June and launched an August 3 assault on the north-western town of Sinjar — home to tens of thousands of Yazidi — view them as "devil worshippers." Omar is one of an estimated 50,000 who fled the attack on Sinjar after the Islamic State threatened to kill Yazidis who would not convert to Islam. Many scrambled up Mount Sinjar and were unable to leave after being encircled by the Islamic State, creating a humanitarian crisis that eventually prompted international intervention in the form of US airstrikes on Islamic State positions and supply drops of food and water. "We just left our houses, we don't know what happened. We took our bodies and our clothes and escaped," she said, and her family fell apart in the process. Turkish authorities refuse entry to Iraqi refugees without passports, so her ID-less four-month-old son is with her husband's family a few miles away in the Iraqi town of Zakho. For Omar and others in the Silopi camp, the journey was tough. A mother shows the huge wounds on the back of her son's feet from where his shoes chafed during five hours of desperate flight. Many are still sunburnt, some badly. 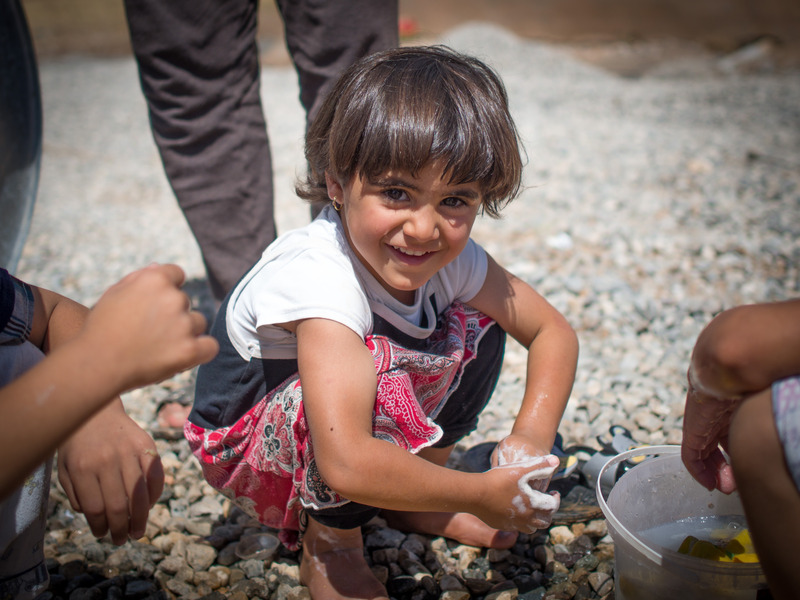 Most took refuge on Mount Sinjar for a time, where there was no food, water, or shelter. Some refugees talk about eating leaves and bark, others of groups of men risking Islamic State patrols to fetch water. On one such venture, six died. Scores of others did too, especially the less resilient, as a result of the brutal conditions. "Many her age died because of the heat," said one man, gesturing at a two-year-old girl playing outside a tent. "I saw lots of bodies." But they all said they would prefer to die than be caught by the Islamic State. Panicked stories circulate throughout the camp describing the fate of those who were. The men, they say, were executed en masse, and the women carried off to be sold. Worse rumors are passed from person to person as well; amputations, burnings, and a pregnant women being killed and having her unborn baby ripped from her stomach. Eye witness reports are little better. Neber Janim, 23, told VICE News that he saw militants gunning down civilians and then smashing their skulls with rifle butts. "I saw them killing people with my own eyes; they shot them and even if they didn't move, they beat their heads with their guns to make sure they were dead,” he said. Janim, who flew in and out of Mount Sinjar as part of helicopter rescue missions, said he also saw the bodies of women hanging from electricity transmission towers. It's hard to verify these accounts with accessing areas now under Islamic State control effectively impossible. However, there is a level of consistency in the stories of massacres and abductions, which is reflected in various reports and official statements. Iraq's Human Rights Minister Mohammed Shia al-Sudani told Reuters on August 4 that Islamic State gunmen had killed at least 500 Yezidis and buried some alive — including women and children. An additional 300 women were kidnapped as slaves, he added. The Silopi refugee camp itself is currently home to around 720 people. It is centered around a small group of unfinished and somewhat dilapidated concrete buildings, constructed by the Turkish Housing Development Administration and each housing more than 20 people. There's no glass in the windows, which doesn't matter too much in the 105 degree heat, but it will when autumn and winter arrive. Nearby, is a row of huge tents each housing around 70 people. 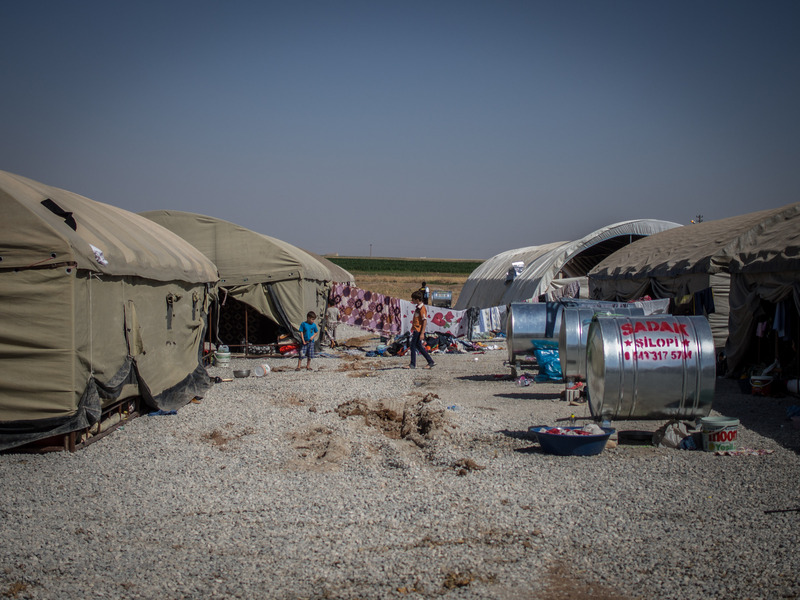 The camp, organizers told VICE News, is funded purely by municipal authorities, NGOs, and local residents — it receives no support from the Turkish state. There are another 500 Yazedis in Silopi itself, the organizers added, and a further 120 to 200 in a school being used as a detention facility nearby, after they managed to cross the border without papers. Omar's story of family breakup is almost ubiquitous. Many left passport-less relatives in Iraqi border areas like Zakho. There, she said there was little access to aid and displaced Yazidis are reduced to waiting under available shelter for help that may or may not appear. "They have taken our children from our breast," said one woman who had left a father and son on the other side to seek help for her younger children. There are other ways to reach Turkey, but they are illegal, dangerous, and in some cases expensive. Some refugees risked a crossing at Hezil Suyu river, which runs along part of the Iraqi-Turkish border. One mother told VICE News that her son was almost swept out of her arms in the attempt. Enterprising smugglers, meanwhile, are now charging $600 each for human cargo. Camp officials said that, unlike the expedited process for refugees fleeing the civil war in neighboring Syria, refugees crossing into Turkey without papers could be held for as long as three months. As a result, they said they are reluctant to turn those who arrived illegally over to authorities. "It’s quick for Syrians, but for Iraqis, it can take a long time," a lawyer working at the Silopi camp said. "We are afraid to give people without passports to the police." It may have been the Islamic State assault that finally drove the camp’s residents from their homes, but it came after years of persecution, including previous attacks by extremists and repression from the authorities in Iraqi Kurdistan. According to Janim, the local Arab population was already hostile towards Yezidis. He alleged that in some cases some Sunnis had been in touch with the militants and had "united with them when they arrived to catch and kill us." He said other Sunnis in his village, however, warned he and his family to leave. Omar said the persecution had already become too much before the Islamic State appeared and that she'd had problems accessing healthcare and education. "We are blockaded in everything as Yazidis in Iraq.... If not this year, then next year, they will kill us. We are a minority and we are in danger," she said. Many others also vowed never to return to Iraq, no matter what the circumstances. One woman, who asked not to be named, told VICE News that she didn't know who now controlled her village and didn't care. "We didn't see any beauty or good in our lives, but we want a good life for our children... There have been attacks on Yazidis in Iraq throughout history, so we will not go back anymore," she said. Discussion quickly turns to where they will go next. Most said they want to make a home in Europe. One man said he has heard that Germany will give out residency permits, another thinks Armenia will. For now, however, Iraq's Yazidis say they are a people without a country.